Для получения надо пройти небольшую цепочку квестов для любого спека, доступна после получения 35 уровня артефакта. Начало в Аметистовой цитадели. Как ориентир квест где красными буквами написано для какого спека, после выполнения надо там же взять квест на разблокировку Дар Шестерых и встать в круг как на скриншоте. What is the connection between this achievement with in-game "Power Unbound" achievement? While the description of the achievement is exactly the same. And frankly I can't find the later achievement anywhere. This achievement appears to be bugged at the moment as I completed the scenario visited all three book empowerment sites, saw Khadgar got the tome, went to my order hall, spoke to the research guy and got the 26 AK level. The forge shows my weapon at 54/54 of traits and AK level 26. No dice, nothing happens. I did not get the achievement. I put in a battle ticket but those take a while now. Will get back to you guys later. OK its now about half an hour later. What happens is Khadgar back on the broken shores at Deliverance Point will have a quest for you called Investigating the Legion. The AK researcher should have been programmed with a breadcrumb but oh well. That is the start of a long quest line to get Master Artificer I believe. Along the way so far, the Purple Parlor council is bugged, the council just slowly walks back to the door without saying anything (aint this awful?) 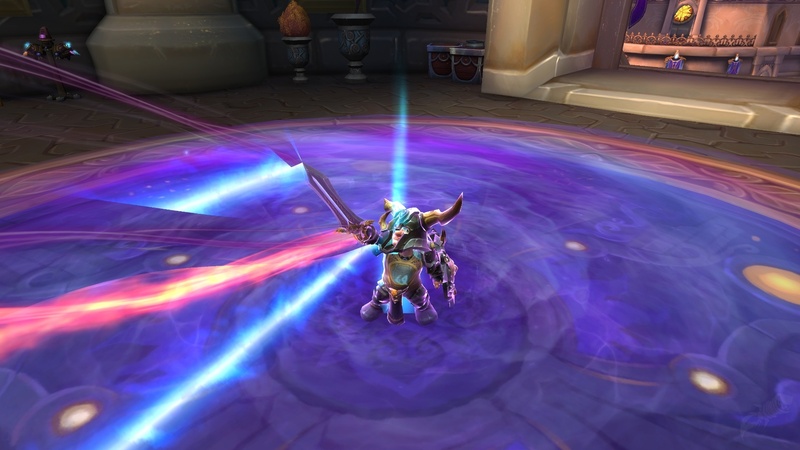 if you take the portal you go back to the Citidal in Dalaran, "DON'T PANIC" Take the portal back to the Purple Parlor walk around like a chicken with his head cut off and you will get completion, wait a while or do the portal and back and you will then have the class specific quest to continue. Will get back later guys. That is all folks. Once the class specific chain is finished you get the breadcrumb to talk to Modera and zippity do dah you unlock your artifact weapon. Naturally any AP tokens you got before figuring out this little puzzle (Blizz you screwed up again, lucky we love you) are invalid for AP. Seems this only affects those who are 54/54 traits. When you just turn 35 traits it works out smooth as my second alt proved. After I got this achievement, I had to relog to refresh my trait window to get the new ones to show up. I just got this on my havoc DH but when I switch to vengeance the new set of traits isn't there, do I need to do something else? I don't even see where this achievement is in game. There is an achievement called "Power Unbound" which states "Unlock a new set of traits for one of your Artifacts." like this one, and then there is "Power Unleashed" which states "Unlock the new set of traits for all of your Artifacts." Neither of the ones I listed are in the Wowhead database, which means there are most likely this one and another one, renamed. Completing this would only let me unlock the new traits for my Gaurdian Spec, but Resto is my main.. how do I unlock it for Resto now? I've completed this on both my Ret spec and Protection spec but I can't get it on my Holly spec. This whole questline is useless now that Patch 7.3 is out, right? I have ALL of my artifacts choices maxxed out and am now just adding to my central Agility/Intellect/Strength circle as my last use of artifact points. what exactly does this even do? my arms spec war breaker was unchanged when I was done with this. Bummer. I read it wrong and thought I was unlocking my first hidden artifact appearance. Boo! Разблокируйте новый набор особенностей одного из ваших артефактов.